Wish you all a very happy and prosperous Deepavali/Diwali. Ever since we returned from India, I have been thinking about making something for Diwali. But somehow it never went from just a thought to action. One month of not stepping into kitchen, has it’s effect on me still. I asked V to hang the Diwali lights in our patio. I was planning to call that our celebration. But then,I wanted to have something special for this festival. 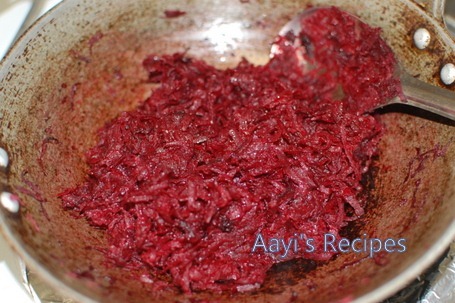 Beetroot halwa was on my mind for a while now. I distinctly remembered the taste from childhood. I almost always have beetroot in my refrigerator as it is one of Ishaan’s favorite vegetables. I decided to make some halwa yesterday. As you can see, it is quite easy to make, perfect for a person who has active toddler pulling on her legs all the time!. The only time consuming part is grating the beetroot. Beetroot is quite hard to cut when it is very fresh. But after a few days in fridge, it becomes a little soft. That’s when I used it. It was quite easy to peel and grate. For any other dishes, I cook the beetroot with skin and then peel and cut it. 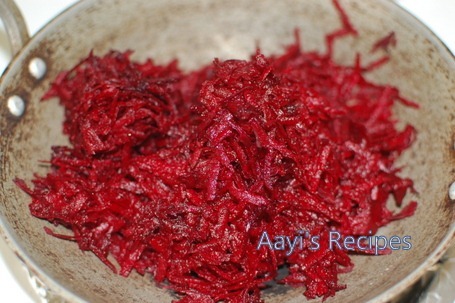 But here, beetroot has to be grated fresh. 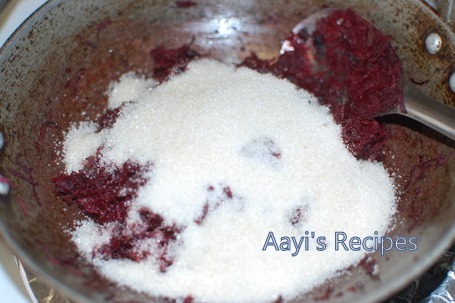 Adjust the sugar based on sweetness of beetroot. I would suggest starting with 3/4th the quantity I mentioned below. Then increase it if required. The ones I used were quite sweet (compared to ones I tasted in India recently). You can add some cashews fried in ghee. I loved the pure halwa, so I did not add any dried fruits. It came out just like I had imagined, just the way I remember it from my aayi’s kitchen. The halwa decreases considerably after cooking, so keep that in mind while making it. Some people add milk to it and make it on the same lines as carrot halwa. Heat ghee in a thick bottomed kadai. Add the beetroot. Keep mixing it once in a while. Keep the heat on medium to avoid burning. When it looks cooked and reduced in quantity, add sugar. Mix. Let it cook down. When the mixture starts looking dry, take off heat. Add cardamom powder, mix. Serve warm or chilled. (Add cashews fried in ghee on top if required). Even I add lil milk to halwa.. didn’t know we can make this way too!! Looks delicious and I love the color!! Hello Shilpa. Wish you & your family happy Diwali. Thanks for making my cooking better. 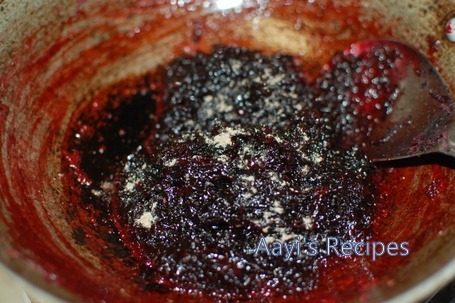 I always take a look @this site before preparing any traditional GSB recipe. I’ve never heard about beethalwa. Can’t wait to try it. 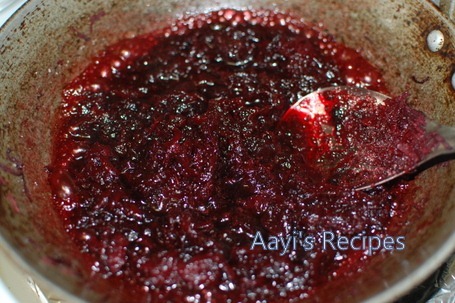 First time here… liked your recipes very much… step by step pictures and method are very easy to understand….. glad to follow you..
We usually have beets either just cooked with some butter or we have them pickled. This is something different. Will have to try it for a change of pace. What types of foods do you usually have with this? Looks soo good! 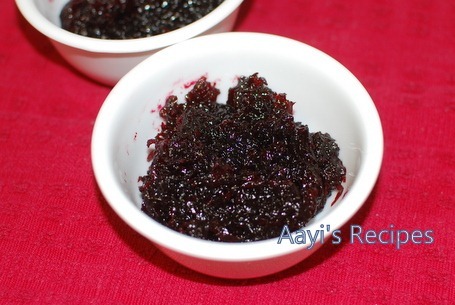 I havent tried beetroot halwa yet. Your post makes it so tempting! I tried this halwa today and it came out really well.. Lets c how my son will react … he hates beetroots but has a sweet tooth…..Hope he likes it and eats beetroots at least in this form …. otherwise it is so difficult to make kids eat healthy veggies . …. I will try this receipe …. while seeing this picture i was so tempted to try that… i hope it will works for good health……..